Under the umbrella of Community Service Sector and in collaboration with Elsevier Research Intelligence, Misr International University conducted a workshop entitled “Performance Indicators” on Monday November 20, 2017. 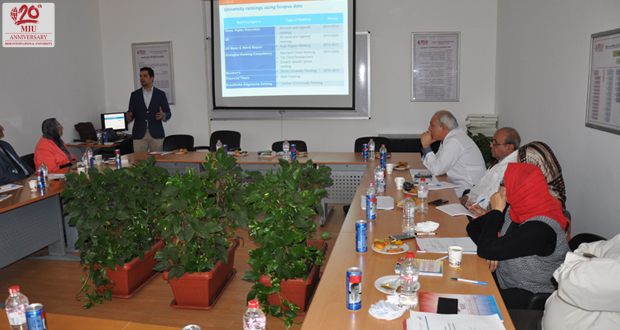 The workshop was conducted by Dr. Mohamed Amir, Africa Regional Manager, Elsevier Research Intelligence. All deans, vice deans and staff members representing all faculties participated in the workshop. 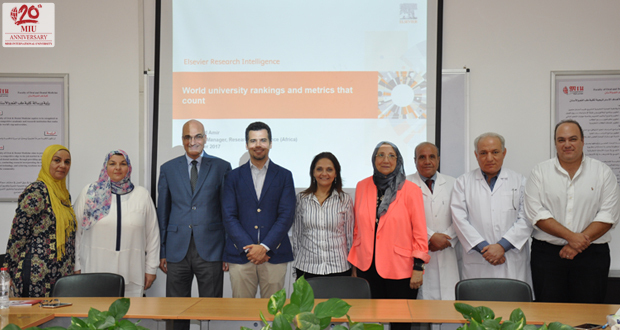 The aim was to discuss University ranking methodologies, University ranking using Scopus data, metrics that count and help improve this ranking as well as the way university data submission impacts ranking-. Eleven attendees evaluated the workshop as excellent while 4 attendees evaluated it as very good. The recommendations mainly included extending the workshop time and providing handouts.